Queen Alexandrine, who was born Duchess Alexandrine of Mecklenburg-Schwerin, was the first known owner of this jewel, which can be worn as either a brooch or a pendant. 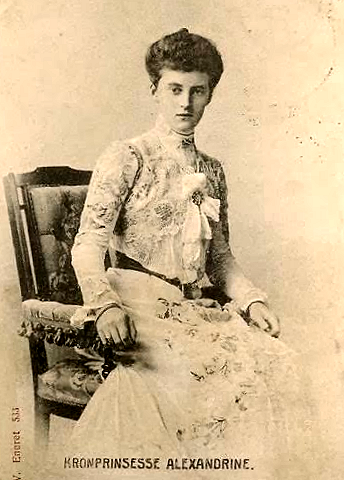 Above, you can see the jewel pinned to the front of Alexandrine's dress; this portrait was taken between 1906-12, the period when Alexandrine was Denmark's crown princess. The piece was later worn by Alexandrine's daughter-in-law, Queen Ingrid, and her granddaughter, Queen Margrethe II. 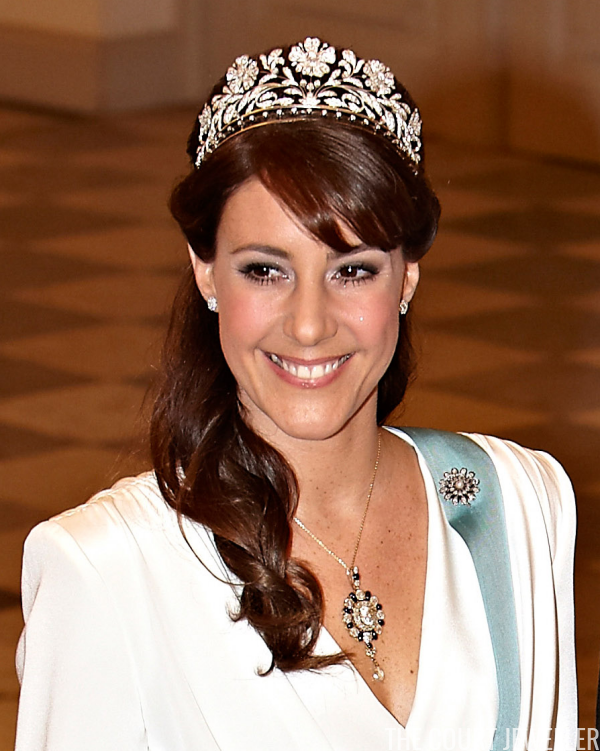 The current wearer of the jewels is Queen Margrethe's daughter-in-law, Princess Marie. 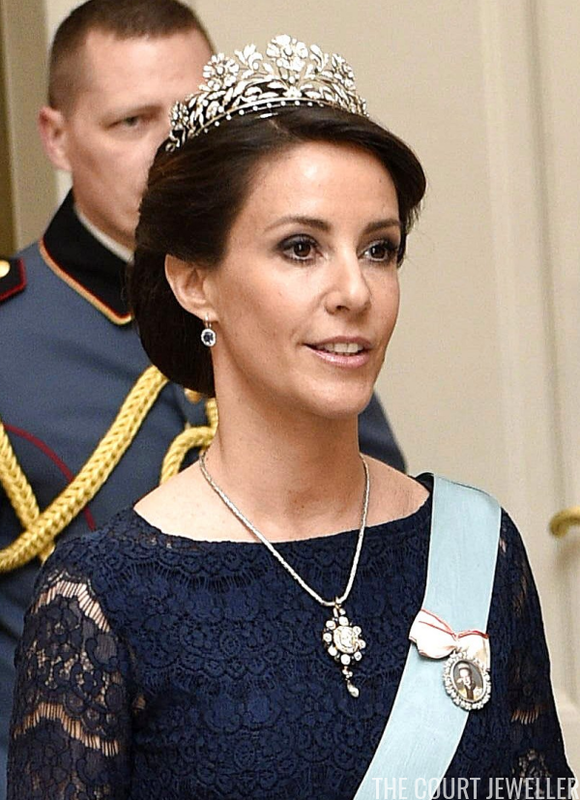 She has been photographed in the brooch/pendant since the early years of her marriage to Prince Joachim. 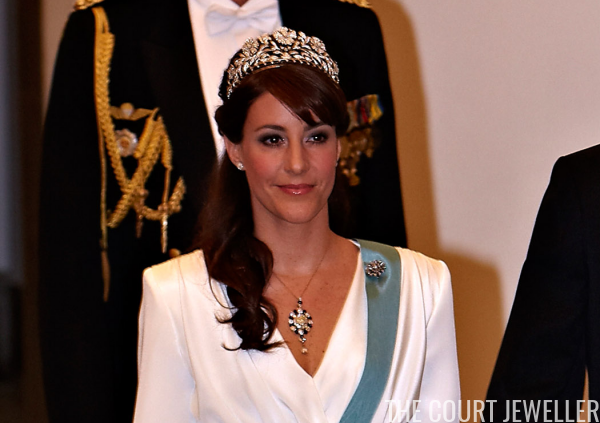 Above, she wears the piece as a pendant in April 2010 for Queen Margrethe's 70th birthday celebrations. Marie also wore the pendant in January 2010 for the annual New Year's Levee in Copenhagen. This was a fairly rare instance when Marie wore a necklace for an event which also required her to wear the collar of the Order of the Elephant. Like Queen Alexandrine, Marie has also used the jewel as a brooch. Here, she uses the brooch to secure the sash of the Order of the Crown during a state banquet for King Willem-Alexander and Queen Maxima of the Netherlands in March 2015. One of her most recent important outings in the piece came during Queen Margrethe's 75th birthday celebrations in April 2015. On this occasion, Marie wore the pendant with a dark blue gown, which made the sapphires in the jewel recede into the background color-wise.